You might be wondering, who Jennings is. Most of us have never even heard of this artist. Mary Jennings is not only just a singer, songwriter, and pianist from Nashville, NY, but she could very well be one of the hottest talents ever to hit your ears. She’s beautifully talented and really a breath of fresh air. She is exactly what mainstream radio needs. Much of her musical talent is owed to her grandparents. They are both musically gifted. Her grandmother plays the piano, and her grandfather is vocally gifted. While her inspiration was attributed by her grandparents, she cannot deny that some of her drive to perform is dedicated to her late mother, who tragically passed away while she was still in high school. This is when her gift poured onto paper and then transferred into the words in her music, especially in her CD, Femtastic which was released in 2007. “I really don’t like to consider my first two CD’s, because this was therapy for me. 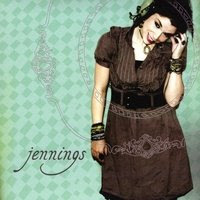 When my mom died, it was a way of coping,” said Jennings. Her newest project, Storybook EP just launched this year is a collaboration of beautiful melody, heartfelt sounds of the piano and electronic pop that all combines to compliment her pure and innocent voice. “You can say whatever you like about the EP. The songs are Doorway, Figure Me Out, Hero, Your Way, and Umbrella. A lot of people find it interesting why I called it "Storybook." It has everything a storybook has...a hero, romance, love longed for, love lost and...wait for it...A COVER! hahahaha!” said Jennings. While I could compare her music to Sarah MacLachlan, Jewel, or Nina Gordon, she is well deserving of her own unique style that stands out on her own. Not only is her music breath of fresh air, Jennings is a wonderful and warm person. I was pleasantly surprise that she is so down to earth and actually funny. In my interview with Mary, she gave a little singers secret. I was watching another one of your video blogs on Youtube and you talk about eating Lays Potato chips. Can you tell me more about that? Can you elaborate about the songs you've written and tell me the significance of some of some of the songs? Why are these songs so meaningful to you? Have you had any offers from any major record labels? If so, who made an offer to you and what happened? Can we expect maybe a video or TV appearance in the future?